February 3, 2005, 3:23 PM · The spirit of Jascha Heifetz was alive and well on Wednesday, as members of the Jascha Heifetz Society gathered at Benning Fine Violins in Studio City, Calif., to celebrate the master's birthday. His presence certainly inhabited this party, in the memories of people who were his former friends and students, in the spirit of the violinists who performed for the evening and even in a few of his possessions that were on hand. I have to confess to a bit of blasphemy: that I have no personal link to Heifetz whatsoever. I did not grow up listening to his music. My childhood teacher was accepted into Heifetz' studio at USC and actually decided against taking from the master on the basis that Heifetz was more a performer than a teacher. So my first impression of Heifetz was of someone my trusted teacher avoided. Then I went to Indiana University, where my teacher, Henryk Kowalski, asked, "Who is your favorite violinist?" Well, being a Colorado girl, I was true to both the Broncos football team and Eugene Fodor, our local hero, violinwise. So I said, "Well I like Eugene Fo.."
"NO!" boomed Kowalski. "That is not your favorite violinist! Your new favorite violinist is Heifetz! HEIFETZ!" So I got a few recordings. But I still didn't get it. The sound on the recordings was not like the pillow of sweetness one finds in many modern recordings, and I do have a bit of a sweet tooth. I was fond of his Sibelius, but I did not turn into a Heifetz nut. Then more recently I carpooled to a distant gig with cellist friend, Michael Masters. He is a true Heifetz nut. He has every recording ever made, and he knows them inside out, note for note. So during the course of several carpools, he played recordings of nearly every major concerto, plus many showpieces, rhapsodizing the entire time..."Listen to the way he does that...that spiccato! And that turn of phrase, like it's ironic. Then ah, up to this, and that run, that RUN!" You get the picture. I was seeing it now, and I was hearing it, too: Heifetz had an acute musical intelligence, and he had complete control, the kind of technique that no one but he has ever achieved. So back to this lovely gathering Wednesday of people who knew him personally and professionally. The evening, and the entire concept of the "Jascha Heifetz Society," was arranged by the elegant Claire Hodgkins, a violinist who was an assistant to Heifetz. During its five years of existence, the Jascha Heifetz Society has awarded 150 scholarships to young musicians, presented master classes with Ruggiero Ricci and Sherry Kloss and put on various recitals and educational forums. The birthday party included a recital by violinist Min-Jin Kym, who received the Society's first-ever Heifetz Prize in 2004. She is Korean-born and lives in London. About 50 people gathered in the cozy recital room at Benning Violins, with a 1946 picture of Jascha Heifetz sitting atop the grand piano, casting a contented expression over the events. Cellos hung along one wall, with some 60 violins in rectangular cubbies along another. Behind the piano hung a large photo of violins drying in the sun, as if on a clothes line, over a tulip-lined garden path and among blooming trees, an old-world building in the background. For the occasion, Min-Jin played a range of works, from Bach and Beethoven to "Meditation from Thais" and "March from 'The Love of Three Oranges'" on her 1697 Stradivarius. The program notes included a quote from "The Strad," calling Min-Jin an heir to Heifetz. Here she was, playing for some of the finest and most accomplished violinists in Los Angeles who personally knew Heifetz. She played with poise and elegance, though I'd be curious to see her play with her regular pianist, her sister Min-Jung Kym. Apparently she had not much rehearsal with pianist Mark Richman (they both had been sick all week), and this made for some disconnect. Well, those are big shoes. I think any violinist who takes it upon himself or herself to build the kind of technique this young woman had, to play with intelligence, knowledge and restraint, to show great devotion to the violin and to continue striving to be an artist for a lifetime can be called an heir to Heifetz legacy. He is the one who blazed that trail. 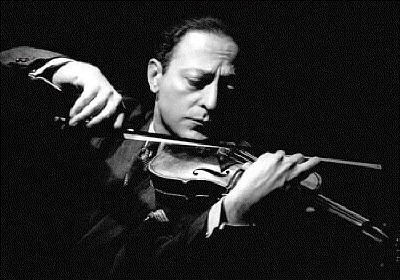 But there will be no other Heifetz than the man himself! She had some lovely moments in the Bach (this was Heifetz's arrangement for violin and piano -- I confess that I think the Bach stands alone better, call me old-fashioned) and in the "Habanera" by Ravel. After Min-Jin played, Hodgkins introduced everyone to a 17-year-old violinist named Sean Lee, a current student of Ruggiero Ricci. Lee played Paganini Caprice 24 for us, then the Largo from Bach's C major Sonata. What relaxed octaves he had, what a fluid left hand! I just smiled to see it. He had the manner and gait of a high school kid, but something very close to full maturity on the violin. To play Paganini is to challenge the technique, to play Bach is to challenge the mind, and he was up for both. I looked at his long red tie and black suit, just a tiny bit big on him, and thought, "Looks like he will grow into this just fine!" The frosting on the cake was Bruce Dukov, who played his "Happy Birthday" variations duet with violinist Ron Folsom. I had heard these variations before , but they were an absolute scream live. The variations are extremely virtuosic, peppered all over with quotes from Wieniawski, Paganini, Bach and the like. Visually, they come off like a comic duel, with "Happy Birthday" so intertwined in the two parts that one can't tell who has the theme and when they switch off. The two also played Dukov's new arrangement of "Stars and Stripes Forever," which he has promised to tell me more about once he gets it up online. Dukov's penchant for crafting delightful and virtuosic showpieces from familiar tunes recalls another facet of Heifetz' legacy: that he created so many arrangements and transcriptions of pieces for violin. People still follow in those footsteps. After all the violin playing came the champagne, chocolate, conversation and instrument ogling. A man named Kenway Lee had brought an old violin case of Heifetz', lined in light green and wearing the initials "J H" by its handle. Though he did not have Heifetz' violin in the case, he did have Fritz Kreisler's Hill bow, which I took in hand, wondering if a bit of magic might rub off. At one point, Hodgkins was showing one of Heifetz's mutes, one he used himself. We all just stared: the actual article, something Heifetz used all the time. Min-Jin looked at it with some awe and asked, "May I touch it?" I think that's what we'd all like to do, just touch a little bit of that magic. One thing is abundantly clear: his great legacy has reached around the world and touched us all, whether we know it or not. It will live on, through his students and their students, through his recordings, through his transcriptions, and through his sheer example. "To play Paganini is to challenge the technique, to play Bach is to challenge the mind,..."
Is this an original Laurie Niles quote and if so may I use it as a tag line, with attribution, of course? I really like your writing style. Thanks for opening windows to the world of classical music for us little folk in fly-over country. I always enjoy your blogs (and everyone elses) but this one is superb.